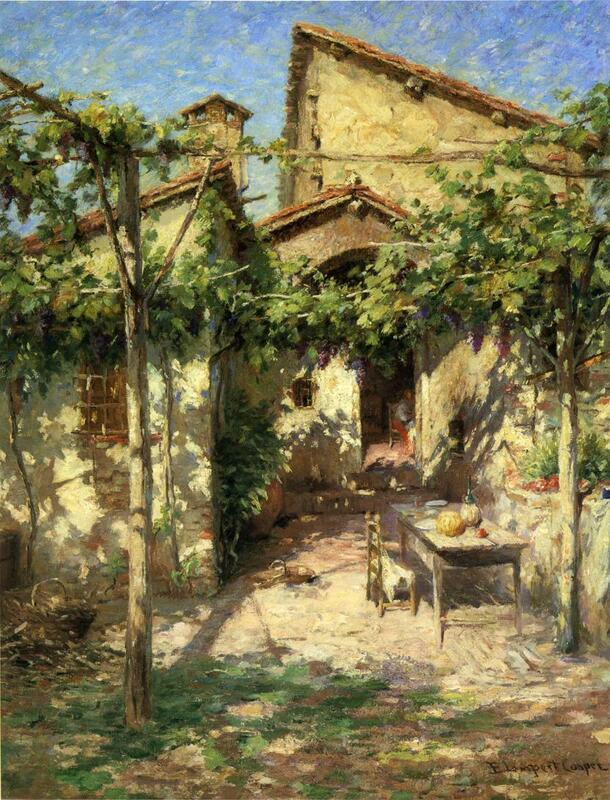 Emma Lampert Cooper (1855-1920), Courtyard Scene (date not known), oil on canvas, 81.3 x 63.5 cm, Private collection. The Athenaeum. Known today only as the first wife of Colin Campbell Cooper, Emma Lampert Cooper (1855-1920) was as highly regarded as a painter, but since her death her works have all but vanished. Emma Lampert, as she was then, was born to a German immigrant leather tanner, in Nunda, New York. When she was young, her father’s business flourished, and they moved to Rochester. She studied at Wells College, Aurora, New York, and at first developed her painting through friendship with a local millionaire, who owned an art gallery. She thus had her own studio in her friend’s city premises between 1870-1886. She was a founder member of Rochester Art Club in 1877, eventually rising to be its president in 1889. She attended the Art Students League in New York City, where she was taught by William Merritt Chase and Agnes Abbatt, and attended Cooper Union. In 1886, she travelled to Paris, where she studied under Harry Thompson, and had a landscape exhibited at the Paris Salon in 1887. She also studied under Hein Kever in Holland in 1891, and at the Académie Delécluse in Paris. She went to Holland again in 1895, where she met Colin Campbell Cooper, whom she was to marry in 1897. She had started teaching by 1888. After her marriage in 1897, the couple moved to Philadelphia, but also kept a studio in New York City. She travelled frequently with her husband, returning to Europe on several occasions, and was with him on board RMS Carpathia in 1912 when it rescued survivors from the loss of the Titanic. The Coopers were then on their way to visit India, where they painted extensively. These are the few paintings of hers that I have been able to find images for. I apologise for their small size, and for the lamentable lack of detail on them. Emma Lampert Cooper (1855-1920), Spring Landscape (date not known), watercolour, dimensions not known, Private collection. Wikimedia Commons. Emma Lampert Cooper (1855-1920), Below the Dyke, Holland (1891-1900), further details not known. Wikimedia Commons. Emma Lampert Cooper (1855-1920), The Breadwinner (1891), watercolour, dimensions not known, Memorial Art Gallery, University of Rochester. Wikimedia Commons. The Breadwinner (1891) received an award at the Chicago World’s Exposition in 1893. Emma Lampert Cooper (1855-1920), Courtyard Scene with a Lady (1891-1900), further details not known. Wikimedia Commons. Emma Lampert Cooper (1855-1920), A Lane in Holland (1891-1900), further details not known. Wikimedia Commons. Emma Lampert Cooper (1855-1920), The Little Shop, Holland (1891-1900), further details not known. Wikimedia Commons. Emma Lampert Cooper (1855-1920), Villa Terrace (before 1910), oil on canvas, dimensions and location not known. Wikimedia Commons. Villa Terrace (before 1910) was painted at Arcetri, Florence, Italy. Emma Lampert Cooper (1855-1920), Stone House (date not known), further details not known. Wikimedia Commons. In 1915, the Coopers exhibited the paintings which they had made when they visited India, at the Memorial Art Gallery, Rochester. Her husband, Colin Campbell Cooper, showed a total of 21 paintings, and Emma Lampert Cooper showed 22. Her work received similar – if not more enthusiastic – critical acclaim at the time. Colin Campbell Cooper‘s paintings are now in 36 major public collections, including the Metropolitan Museum of Art, Brooklyn Museum of Art, Musée du Luxembourg (Paris), the National Museum of American History at the Smithsonian Institution, and the White House. Emma Lampert Cooper’s paintings are now in just four smaller public collections. Would it be wrong to conclude that public collections were and remain prejudiced against women painters? Posted in General, Painting and tagged Chase, Cooper, Impressionism, painting, women in art. Bookmark the permalink. I am a devoted fan of the artist Emma Esther Lampert Cooper, and have studied her and her work. I have visited her birth town of Nunda, NY, Wells College in Aurora, NY and viewed the paintings held by the college, have examined the collection of her personal papers housed at the library at the University of Rochester, visited the apartment building she and Colin lived in in New York City, viewed her grave in Mt. Hope Cemetery in Rochester, and other venues associated with her life. Her work occasionally appears at auctions in this area, and I take the opportunity to go whenever possible in order to view her work. Whether public collections are prejudiced against women, I cannot say. In the case of Emma and Colin, the fact that he outlived her by several years may have contributed to the fact that he was able to self-promote and market his work more readily. They were interesting people who lived interesting and adventuresome lives, and I appreciate their work and story. Thank you – I am delighted to hear that. Are you intended writing anything about her? The biggest problem for writing articles like this is the shortage of usable images, and of biographical information. Because we know quite a bit about their life together, the latter is not quite so critical in her case. But there is a terrible shortage of good images of her work (which is sadly typical for women artists). Can you share with me how you became acquainted with Emma and any other information? You mention her association/friendship with a local millionaire who owned an art gallery. I assume you are referring to Daniel Powers of Rochester, NY. I have visited the Powers Building in downtown Rochester, which was the venue for the art gallery and Emma’s studio. I believe the library of the Memorial Art Gallery of the University of Rochester has catalogs of the art shows that were held in the Powers Gallery. Also in the collection of her papers held at the University is a photo of her studio – very interesting. Also, several years ago on a trip to California I was able to visit the Santa Barbara Art Museum which was featuring a special exhibit of Colin’s work, and an art gallery featuring his work. Although it did not feature anything by Emma, it was a wonderful exhibit and collection which made me feel somewhat closer to them both. Regards. I came to Emma’s work through that of her husband. My research on painters for articles here tends to start with one, who leads me to another, and so on in a chain of connections. I was fortunate in her case to discover two online documents which helped: a catalogue of their joint exhibition in Rochester in 1915, and a dissertation on her by Jordan Snajczuk from the University of Rochester. Yes, I was referring to Daniel Powers and the Powers Building. Being on the ‘wrong’ side of the Atlantic, I don’t have the same access to physical resources as I might for a European artist! I own a watercolor signed E. E. Lampert, done in Annisquam, Massachusetts, probably before 1897, since it appears she signed her work as “E. Lampert Cooper” after her marriage. I’d be interested in knowing if there is any information about her coming to Annisquam or Rockport, which is the next town. I don’t know, I am afraid. I believe that her papers are at the University of Rochester, and it would be worth contacting the Memorial Art Gallery there, or the River Campus Library, who may know of someone carrying out research into her life and work. Wow – that sounds really wonderful! I think that most of her papers and records are now at the University of Rochester. In the first instance, I would contact the Memory Art Gallery there. They will almost certainly want to see the painting. The best way to do that is to get a high-quality digital image made of it, so that you can email it to them. I wish you success – with any luck they will be very interested in it. No problems – I have removed the second, duplicate comment. I’m seriously jealous, and delighted for you. Enjoy! I would love to be able to show an image of that painting here, please. My email address is in the About page.